I have often been asked, especially by members of the Dominican Laity (Third Order) where they could get a book with the texts of the Little Office of the Blessed Virgin Mary as it was in 1962. I assume that the reason for this is that they were interested in using that text in private recitation of their Office as allowed under the norms of Summorum Pontificum and Universae Ecclesiae. Through the kindness of one of our readers I can now make available a volume printed by the Order in 1962 of which I was ignorant. 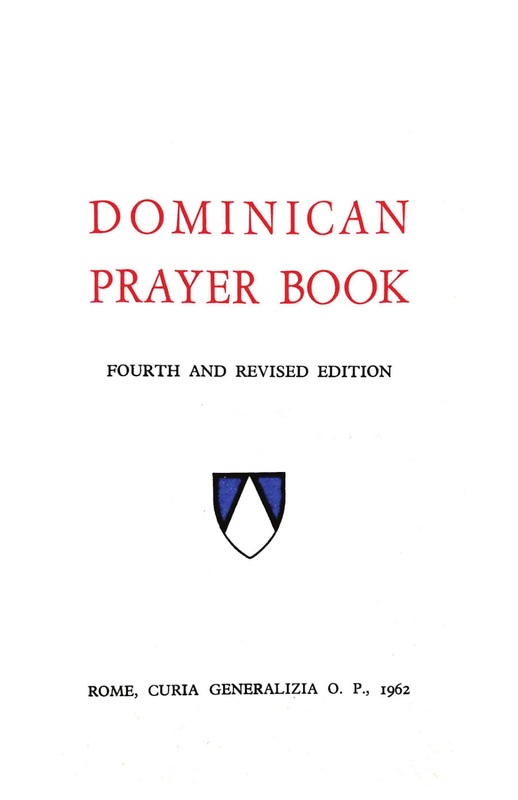 In that year, the Dominican General Curia in Rome published the Dominican Prayer Book, fourth edition. It not only has the Little Office in Latin and English in parallel columns, but also sections of music, devotional prayers, litanies, the Office of the Dead, Penitential Psalms, and so forth. Many of these are also in Latin-English parallel columns. This volume was intended especially for the members of the “Dominican Third Order Secular” (Laity) and the “Dominican Third Order Regular” (Active Sisters), but I think it would also be welcomed by our friars and cloistered nuns. Copies are available for purchase at Dominican Liturgy Publications. Although the scans are good, I urge those interested to view the preview first and decide if the quality meets your needs.